Jet Airways is now effectively a low cost airline. Starting December 17, Jet Airways will no longer serve free meals on board. In a cleverly worded email, Jet Airways says passengers will "have an opportunity" to buy food onboard... Earlier this no free meals policy was applicable to light fares only, now extended to deal, classic etc. I guess free meals is offered only on Economy Flex, which is the most expensive version of economy class fare- costs about 3 times more than Economy Light. It appears that international travelers will still get free meals on economy class- may be that will be axed too next, if their fund situation doesn't improve. If you book right now-i.e before 21 December 2017, you will still get your free meals, even if travel is in 2019. Websites like MMT have been quick enough to add a notification on their results- that food is no longer free and need to be purchased onboard. With severe cash crunch, unable to pay salaries, vendors, Jet Airways is making desperate attempt to save cash and boost revenues. But with now frequent flight cancellations, their reliability is at all times low. 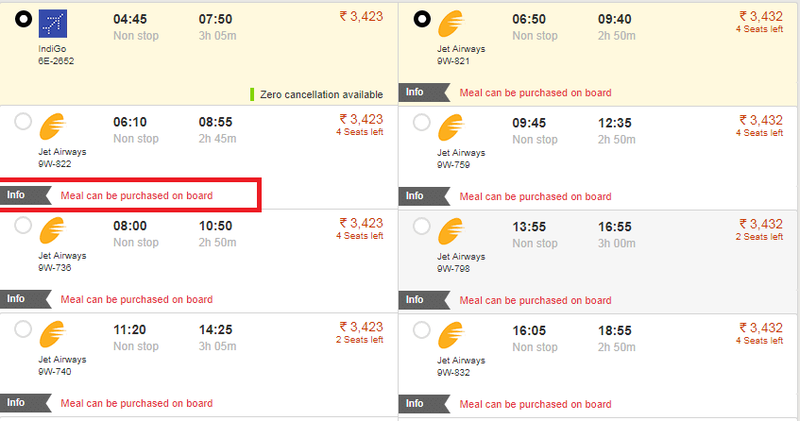 With removal of free meals on board, Jet Airways is now effectively a low cost service provider with full service airline name. With no buyer/fund infusion in sight, need to see how they recover from this mess. Also read: 5 things Jet Airways need to do to avoid total collapse.